If you plan to buy in Aliexpress and don’t have an account in their mobile app yet, today is your day. 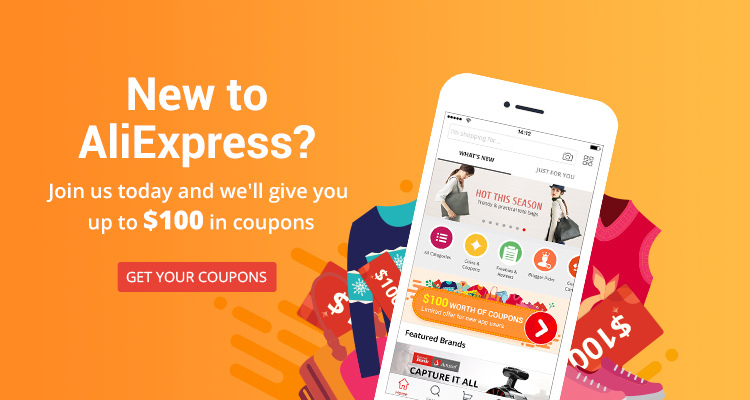 Aliexpress is offering 100$ in coupons for new users on their app until April 10th. The only thing you have to do is Download the AliExpress app and sign in, tap on the “Get $100 in coupons” banner and follow the instructions to get your coupons. Coupons can be combined with instant discounts and sellers coupons. A total of 100,000 coupons will be given away each day. Do not miss out! Starting this month of February, all Walmart.com customers can enjoy Every Day Low Prices with the convenience of fast, FREE 2-Day Shipping on eligible orders without a membership fee. 2-Day Shipping covers more items than the previous ShippingPass, visit Walmart.com to discover all the benefits included in this promotion. All previous active ShippingPass subscribers will receive a full refund for your ShippingPass subscription. Refunds will automatically be issued to the original form of payment within 30 days of the announcement. If you do not receive your refund within 30 days. With this new feature Walmart overtakes its competitor Amazon.com, which still requires to be part of their Amazon Prime program to get the fast free shipping. Samsonite is offering Up to 30% Off Sitewide using the coupon code SAVEMORE. 30% off with orders over $150.